But things at Grandma’s might not be as dull as they seem. Following a mischievous lorikeet deep into the bush, David finds a magical glowing Doorway, and suddenly his life-long wish for adventure becomes more real than he could have hoped. As soon as David steps through the ancient Door it falls to pieces, and he finds himself trapped in Esmorde – a world of magic, mythical creatures and barbarian warriors. He soon learns of the dragon sorcerer Aurasius’ terrible legacy, the Curse to End the World, that will eventually turn every living thing in Esmorde to dust. Will he make it home find the hero Esmorde needs in time? And even if he does, will anyone believe him? “I love children’s novels with strong child or teen protagonists who solve their own problems or issues without much, or any, intervention by adults. 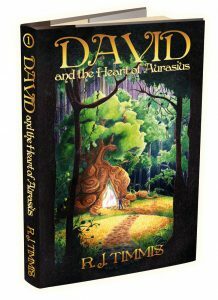 David and the Heart of Aurasius is one such book. David is the quintessential ‘quiet achiever’ who doubts his own abilities at times but through the encounters he faces in the parallel world in this book, manages to come into his own as ‘the boy who could’. As I read this book, I couldn’t help but draw comparisons with the ‘David vs Goliath’ biblical tale. David, a small boy, takes on a bigger, seemingly stronger opponent in the mythical Aurasius.